BW Monastery 吉祥宝聚寺 — Hurray, we are 3!! In the blink of an eye, our class is 3 years old! To commemorate this happy milestone, we held a 3rd anniversary celebration on 30th Dec 2018 at BW Monastery. We arrived at room 301 early with happy and rejoicing hearts. We started off the celebration with a Grand Vast Offering of ten items led by Venerable Bensi. The ten items were incense, flowers, light, water, fruits, tea bags, food, chanting beads, jewels and garments, each of which has its specific significance. The Vast Offering helps us to accumulate vast merits which will lead to better rebirths in limitless lives. 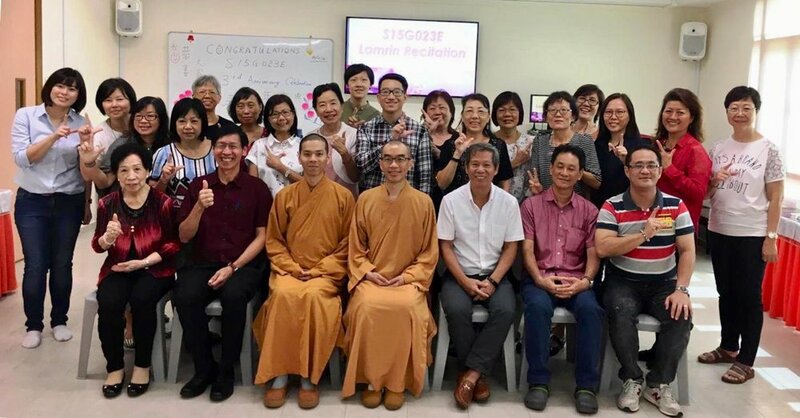 Venerable Bensi was happy that we had completed three years of Lamrim studies. He congratulated us and also reminded us that we need to continue to stay together as a class. As we walk on the path to Buddhahood, it is important to learn with a group of fellow practitioners with the same aspirations and create collective virtuous karma together. He asked if we would stay together for the next 10 years, 50 years or 100 years. The answer is of course a resounding YES! Mega Rejoice! We continued with a birthday celebration for the “December and January babies”, followed by a buffet lunch. We also made a Dana offering to the Sangha. A surprise visit by venerable Abbot Jing Yuan was pleasant though short. We were very happy to see him. 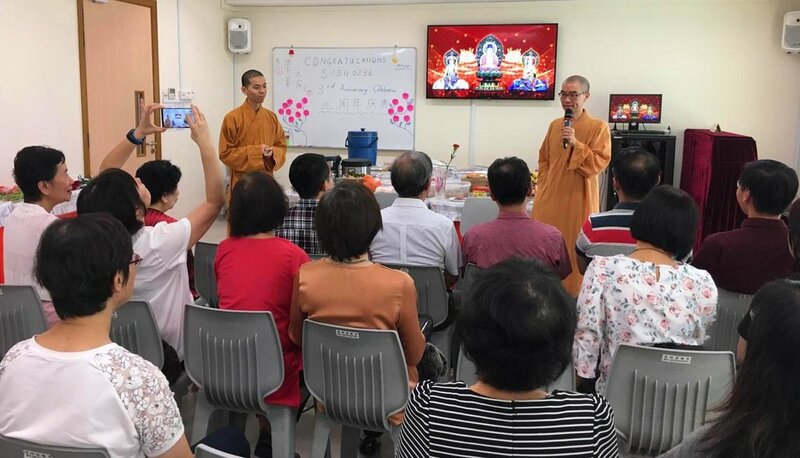 Sis Carolans shared an encounter with Abbot Jing Yuan who had questioned why the food provided for the public at the monastery was in miserly amounts. She observed that actually the food was in fact quite sumptuous and plentiful. And she learnt that the Venerables eat very humbly in PEI yet Abbot Jing Yuan wants us to have better food here. She was very touched by Abbot Jing Yuan's loving kindness to us. Venerable Yuan Man Shi also shared some pointers on how to have good interaction with the venerables. During our lunch, we had sharing on OMAK by the “December and January birthday babies”. Sister Bee Kim and Sister Florence could not join us but they also shared their loving thoughts about their mothers through slides. Most of the sharing was on a mother’s kindness. Brother Tony also shared his appreciation towards Sister Joyce who is his loving wife and a caring mother of their two girls. Many were touched and happily teared. Our mother's love towards us is unconditional and goes beyond space and time. We are their beloved children regardless of our age and wherever we may be. Just like the Buddha, Shifu and Teacher Zhen-Ru also love us as if we are their only child. We have learnt from the Lamrim that we have to learn to truly show our love towards our mothers and gradually to everyone. Cultivation of Love and Compassion are required to generate the Spirit of Enlightenment to walk the Bodhi path. One other learning point is that besides the offering of material things, the greatest offering is the offering of practice in accordance with Buddha’s teachings. Hence, let us strive to do our best to practice what we have learned in the Lamrim. The ripening of the past virtuous karma brings us to learn together in a Lamrim class in which we can encourage and support each other in the Mahayana path. Under the guidance of our Teachers, we can move forward in the journey together which is indeed a great blessing! We also showed our appreciation to our class facilitators and care coordinators for their effort, time, love, care and guidance. 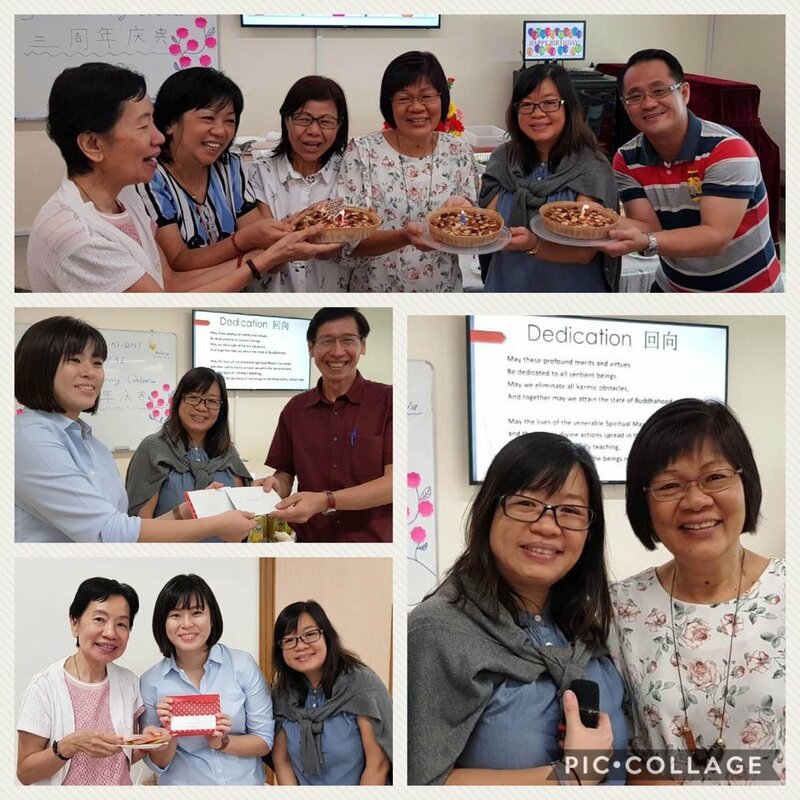 We presented each and everyone of the senior cadres a special 'Thank You' card designed by Sister Jane's daughter to thank them for nurturing us and connecting us with Shifu and our Teacher! We ended the auspicious morning with an Insightful Praise entitled ‘皈依颂’to wish all a happy learning journey with blessings from the Triple Gem always. A big thank you to the organising committee and its team of helpers for making our class anniversary a memorable one for all present! It was a fruitful Sunday morning!! Those who have missed this celebration, we sincerely hope you can join us in 2019! Our Teachers would be very happy if everyone of us can create the collective virtuous karma together to benefit ourselves, our families and others! May our Teachers and the Triple Gem bless us! May we continue to strive towards our ultimate happiness! May our aspirations be fulfilled swiftly!